Thank you all so much for participating and inspiring us with your incredible photos. As always, it was difficult for us to choose such few images for the showcase from all those that were submitted – such stunning images in both color and black and white. Welcome, also, to those newer to our street photography community – it is great to have you join us! We hope you will enjoy this inspiring showcase as much as Ilana and I enjoyed putting it together! Andrew has captured an everyday street scene that pops with color, this and the strong radial composition of his photo immediately draws the viewer in. 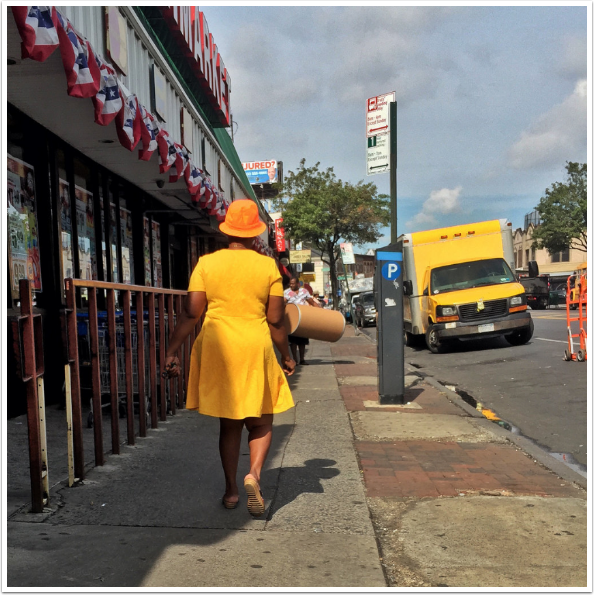 It feels as though we are walking alongside the photographer and behind the woman in her brightly coloured yellow dress and shoes, topped off so nicely with a vibrant orange hat. The bold yellow truck parked at the curb helps to balance the composition beautifully. The person walking towards us carrying some sort of cylinder, (directly in the middle of the radial composition and photograph), also adds to the overall balance of the composition. It acts like bridge leading our eye back and forth between the truck and the main subject. There is such a charm to this image with the woman in her bright summer attire caught mid stride moving into the distance along with the red, white and blue line of flag-fans that lend it a classic Americana feel. Well seen and captured, Andrew! 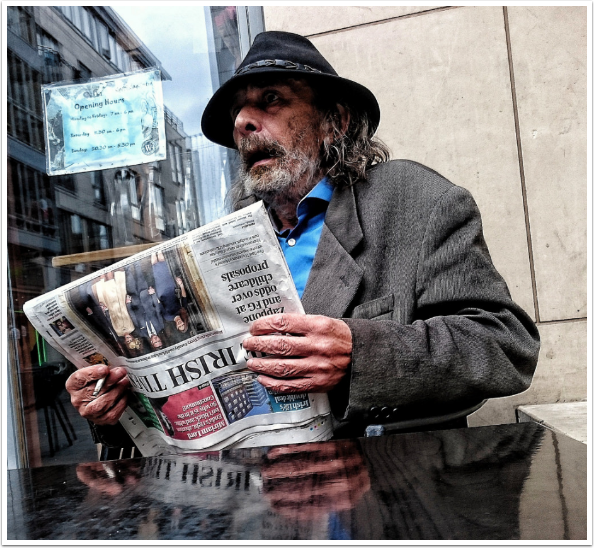 There is something very captivating about a photo that depicts a character reading a newspaper, as it seems so many people on the streets these days are glued to some sort of mobile device. The newspaper also gives the photo a feeling of time and place as we can see that this is a ‘British Times’ publication. The man himself appears in classical form — dapper, if a little threadbare, in his gray jacket and hat. The reflection of the man’s hands holding the paper and almost the end of a cigarette is simultaneously timeless and well seen. The other reflection of the grey-toned building in the window over the man’s right shoulder beautifully balances the grey shades of the man’s jacket and hat. The bright blue of his shirt pops with a splash of color and also draws the viewer into the photo. 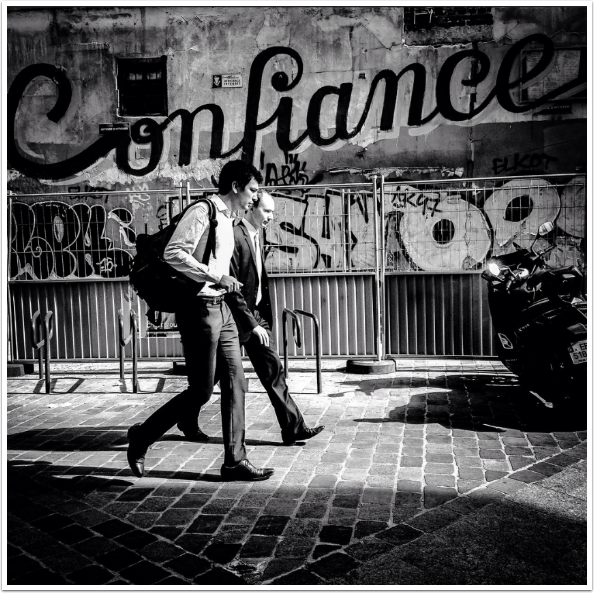 Christophe’s photograph is a wonderful marriage between street and fine art photography with graphic attributes, too. Instantly, the viewer is placed within a city scene, but there’s a surreal quality created by dramatic light and shadows that allows one to feel it might be a dream. 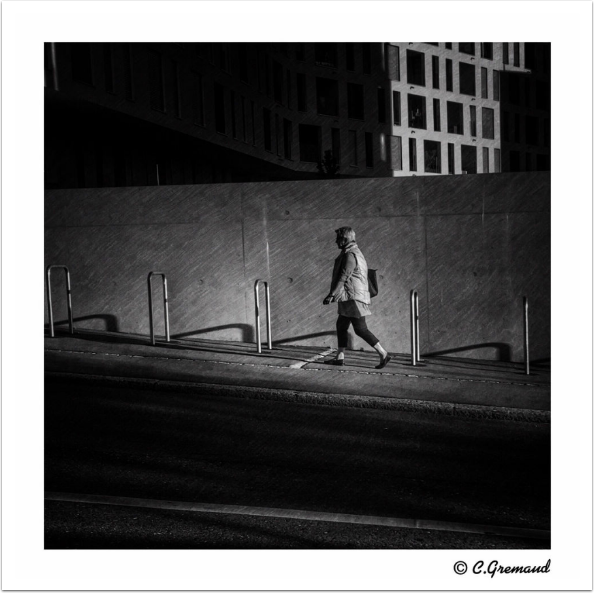 At first, the viewer’s attention is captured by the lone figure upon the street because of the brilliant way the frame is cut into large shadowed shapes and light ones. She appears real enough walking on one of the three lit up spaces an almost triangular swath of concrete that sweeps across the photograph. But, just above and below the woman are dark, dramatic shadows contributing to this image’s graphic feel. The one on top is vertical and so dense its rectangular form propels the eye to the lighter section in the background. To a surreal structure that appears to be constructed merely of a grid of dark squares and rectangles outlined in light. From this illuminated fragment, one’s eye moves back the middle ground and to the subject once again. Her surroundings, from the wall she is walking in front is patterned, (which Christophe cleverly places his subject in the center of), to the wonderful shadows of metal bars that seem to jump up in arcs upon the wall. This wave design moves along with the subject and adds yet more dimension to this masterfully composed photograph. Nicely done, Christophe! Melissa’s photograph is an exquisite example of street photography, what makes this such a great image is the fabulous energy and excitement of the environment — the movement of the two figures and the sheer liveliness of the urban scene. Life is abounding in this spontaneous shot. This photo quickly captures our attention because of the general activity and bustle of the scene. One immediately gets the feeling of action; there’s action on the wall with all the graffiti, (some of it spelling out trust, loyalty), that moves across the entire frame. The background itself, along with the graffiti, has so much going on; there appears an old structure with windows, and weathered plaster, and varying layers of paint. A more modern fence sits in front, as well as, bike and motorcycle stands. There’s action on the pattern of the cobbled street which points directly to the viewer, (drawing us into the frame) so we get the feeling of ‘being there’. There’s action even in the parked motorcycle as it seems to be leaning toward the subjects, its shadow even more so. And, lastly there’s action in the subjects themselves as they make their way, their own shadows following behind. Melissa has timed her photograph perfectly. She captures the two men walking almost at the center of the frame, but not quite. This accords them priority in terms of everything that’s going on, and positioning them this way emphasises their movement through the frame. The wonderful mix of old, (in the building and street), and the new, (the fence and motorcycle), give us a sense of past and present, a timelessness and chance encounter transformed by Melissa’s keen eye into a beautiful image. Well done, Melissa! Honoured! Thnk yiu, Lee, Ilana and Joanne!